It’s official. 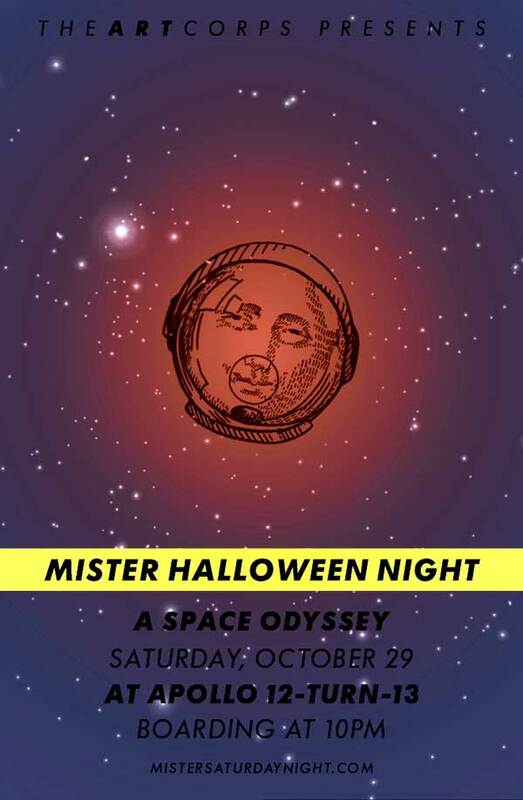 NASA did its final space shuttle launch in June of this year, so the Mister is answering the call of duty, grabbing the wheel and taking a trip to outer space for this year’s Mister Halloween Night. Our favorite loft, 12-turn-13, is being transformed into Apollo 12-turn-13 – a spaceship capable of traveling to distant planets in but a few hours. Captains Eamon Harkin and Justin Carter will be piloting the ship all night, a large window into the cosmos has been designed by first mate Doctor Mojo (we call him Number One), and inflatable spaceship things will be installed by Jeffrey Ralston (we call him Data). Astral outfits will be rewarded with an on-the-house drink. Think constellations, alien life forms (yes, that is a hint that we want you to dress up as ALF), astronauts and anything else that will make you feel at home in space. If you want some inspiration, check the trailers for Fifth Element, 2001: A Space Odyssey, Barbarella, Buck Rogers and Spaceballs. Remember that the more group costumes on the spaceship, the farther and faster it’ll travel (yes, that is a hint that we want to see the entire crew of the Enterprise onboard). Boarding is at 10pm. Get there soon after. It would be a shame to miss liftoff.